Among the 11 teams competing at the RC44 Portsmouth Cup, seven have now won races, showing the level of cut-throat competition that exists in this one-design keelboat class that today sailed its penultimate day of fleet racing on Hayling Bay. Race seven of the series set off in an un-forecast southerly sea breeze. 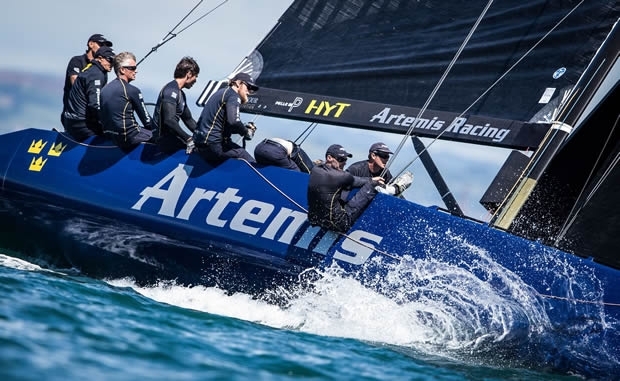 In this Artemis Racing, steered by Torbjörn Törnqvist, started well and pulled out a good lead to become the first boat to score a second race win at this regatta. "I think we sailed well," said Törnqvist. "It was great racing, absolutely fantastic. But it is difficult. There are quite a lot of shifts and you've got to get them right." Italian legend Francesco Bruni took over from Iain Percy calling tactics on board Artemis Racing yesterday and was pleased with the result of today's first race: "We felt that the boat was going well. We sailed that race very well, tactically, boat speed-wise and we didn't take too many risks." Artemis Racing was keen to repeat this in the next race, but proved overly keen and, along with Vladimir Liubomirov's Bronenosec and the new Russian BlackWater team, started prematurely. As this start was held under a 'U flag', this trio was instantly disqualified from this race. Bruni, who will be helming the Artemis Racing AC45 off Portsmouth next week, is used to the shifty conditions in the Mediterranean, but he too is having his work cut out here and was kicking himself for the costly mistake: "We took a risk when we were in a good position and we shouldn't have." In the thinned-out fleet, race two was won by Charisma of Nico Poons, the experienced Dutchman's performance having been uncharacteristically up and down. This makes Charisma the seventh winner among the 11 teams competing here in Portsmouth. Of their second race today, Charisma tactician Andy Beadsworth said that they had a great start, went the right way and didn't see another boat. However, like Artemis Racing yesterday, they sandwiched the win between a 10-11. This is the first time in an RC44 for Beadsworth, a former America's Cup helmsman and he is impressed: "The stand-out feature for me in the class is that mistakes due to poor sailing are punished unbelievably aggressively - more than any class I've sailed in. It could only be worse in a bigger fleet… And if you're at the back of the fleet no quarter is given, because no one wants to be last. So you get smacked. Leading is a lot easier!" As with today's second race, the third was held in a more typical southwesterly. In this Vladimir Prosikhin's Team Nika scored her second race win to consolidate her position at the top of the leaderboard, 12 points ahead. Apart from Team Nika, among the best scoring boats today were those that hadn't won races, including Katusha, skippered by Vladimir Sokolov, with 11-3-2, and the Hugues Lepic's French team on Aleph Racing with 4-2-10. "It is a very tight fleet and a challenging event, but, as usual, very interesting," said Lepic. "We had two good races. But in the last one we started well, then in the middle of the first downwind leg there was a big shift and everyone ended up going underneath which was unfortunate because we'd been third or fourth at the top mark and ended up 10th. Among his crew are legendary four time America's Cup winning trimmer Warwick Fleury and another former Team New Zealander, Hamish Pepper, Aleph's tactician. Pepper has been finding the conditions tough: "It has been a tricky few days. You haven't been able to count your chickens before they hatched. No one race or one side is the same and in fact not even on two consecutive beats or runs, it is just very shifty conditions." Of the 11 teams racing here none seem weak. The top scoring boat of the day could easily have been the Russian-owned BlackWater, co-owned by Alexander Zaytsev, Andreas Savvidis and Maxim Merzlikin, newbies to the RC44 fleet for 2016, had it not been for their over-enthusiasm in race two. "It was very challenging in the beginning," said Savvidis, who was trimming today. "But after each race we gain experience and we can use that in the next races." Fortunately the Moscow-based trio are getting up to speed having many old Russian RC44 hands in their crew from previous Synergy or RUS-7 campaigns. "They have experience in the RC44, so they coach us," said Savvidis. Zaytsev was helming today: "It was quite challenging and we were lucky with the wind and our tactician made some very good strategy and there was little bit of luck and all the team worked perfectly." Going into the final day Team Nika has a solid lead, but in theory any of the top 10 boats could still win. But perhaps most impressive is the mid-fleet competition where seven boats lie within seven points of the podium.